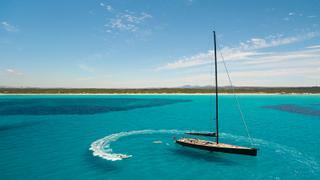 The 30.5 metre sailing yacht Wally Love, listed for sale by Y.CO, has had a price reduction of €1,000,000. Designed by German Frers, Wally Love was built in carbon fibre by Wally Yachts to RINA class and delivered in 2007 as a high performance yacht also capable of relaxed bluewater cruising. An interior by Luca Bassani uses luxurious cherry wood panelling to accommodate eight guests in three cabins consisting of a master suite and two twins plus two Pullman berths, all with en suite shower facilities. In addition, there are quarters for four crew aboard this yacht for sale. The saloon has ample seating, a dining table for up to 10 guests and an entertainment centre including a Samsung LCD large screen television set and a Bose stereo surround sound system. Deck spaces are generous and include two sunken cockpits: one in the centre with a dining table and comfortable seating for idyllic al fresco relaxation, while the second cockpit aft forms a ‘terrace on the sea’ with a large sunbathing pad. The mast is by Southern Spars with carbon rigging while she received a new wardrobe of North 3DI sails in 2017. Under power, a Cummins 330hp diesel engine gives her a cruising speed of 10.5 knots and a maximum speed of 12.5 knots. Wally Love is now asking €3,950,000 with VAT paid.